It’s Sunday, which in my world means Cake day… I haven’t decided what I’m making this week but seeing as I haven’t yet become bored of my new found love for the kitchen, I know I’m gonna enjoy making it. Last week we had loads of leftover cherries thanks to Leila deciding that she wasn’t going to like cherries anymore. Those things are expensive and I couldn’t take watching them slowly grow fur in the fridge. 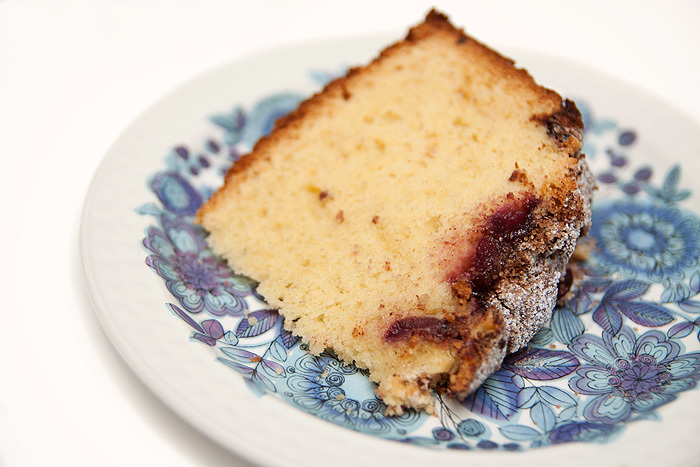 I googled for some recipes and came across one for a tasty sounding Hungarian Sour Cherry Cake. Now, I have no idea if my cherries were sour or not, they tasted pretty ropey so I thought they’d probably do. 1. Cream the butter and caster sugar together until pale and fluffy. Add the eggs and combine well. 2. Add the vanilla or rum. 3. Fold the flour and baking powder into the wet mixture. 4. Pour the thick batter into the prepared cake tin and smooth the surface. 5. Press the cherries into the batter evenly. Just keep pushing the cherries further into the mixture until you’ve used them all up. 6. Combine the cinnamon and granulated sugar and sprinkle evenly over the cherries. 7. Place the tin in the lower middle of a preheated 170C oven (fan oven) and bake for 1hr, or until a cake tester inserted in the middle comes out clean. It needed more cherries… I only had 1 cup. I ended up spreading the slices with cherry jam. Decadent! Have a lovely, restful Sunday! Sour cherries are different from the normal cherries you can buy in this country, I’ve not come across them in the UK at all. They actually have a more squishy texture and they taste quite different. My Mum makes this type of cake too and it’s very yummy. Three of my favourite things, cherries, cake and something sour. Mmm I love sour cherries! I love your plate in the last pic, new or vintage? 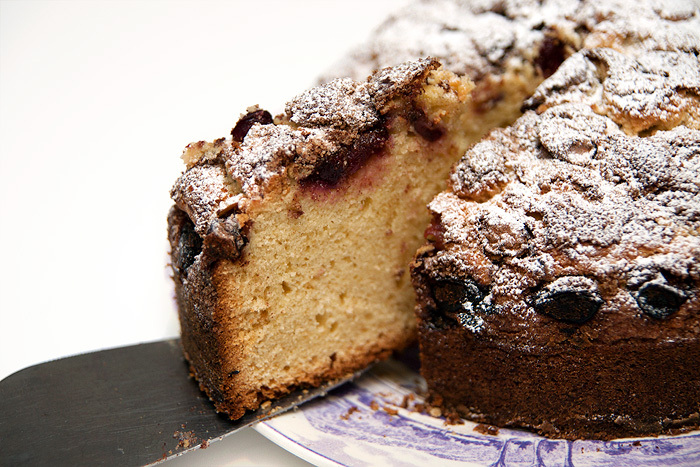 That looks so good and I totally have cherries in my fridge… cake time?! *drool* Now I’m hungry for a dessert.